Virgin Islands, the Western Island Group of the Leeward Islands consisting of Tortola, Virgin Gorda, Jost Van Dyke, Anegada and over fifty smaller islands, has a total land area of 59 square miles and a population of around 20,000. The north-eastern islands that form the British Virgin Islands are referred to as the Virgin Islands. It has a prosperous economy which is based primarily on financial services and tourism. Agriculture and industry account for a small part of the GDP. Many visit the islands as part of a cruise line. December through May are the best time to visit these islands. 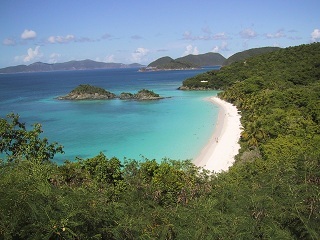 Virgin Gorda, Tortola, Anegada, and Road Town are the oft-visited islands. Many visitors prefer to soak up the sun on one of its many white sand beaches. Sailing, swimming, snorkeling, hiking, bird watching, and cultural tours are the main activities of the island. Fodor’s US and British Virgin Islands 978-1400008650 $13 A 25-page traveler’s introduction followed by chapters on St. Thomas, St. John, St. Croix, Tortola, Virgin Gorda, Other British Virgin Islands, and Travel Smart USBVI. Laminated Virgin Islands Map by Borch 978-3866095175 $10 1:80,000 Scale. Includes Inset Map of St. Croix, Charlotte Amalie, Carlotte Amalie Historic District, Cruz Bay, Chistainsted, Frederiksted, Anegada, Road Town, The Valley (Spanish Town), and Lesser Antilles. The first stamps of Virgin Islands were a set of two stamps released in 1866 showing Virgin and Lamps into two different designs. The set (Scott #1 to #2) catalogs for around $100 mint and around $150 used. The set was followed by another set of six stamps between 1867 and 1870. That set (Scott #3 to #8) which also features St. Ursula along with the Virgin and Lamps design is rare and valuable and catalogs for around $850 mint and around $910 used. The first designs along with an overprint and key types of Queen Victoria (QV), and King Edward VII (KEVII) formed the primary issues of Virgin Islands during the period till the turn of the century. Chief among them was a set of eight stamps released in 1899 showing Saint Ursula with a sheaf of lilies. The set (Scott #21 to #37) catalogs for around $110 mint and around $130 used. King George V (KGV), King George VI (KGVI), Seal of the Colony, and several common design stamps were the primary issues of Virgin Islands during the period till 1951. Chief among them was a set of twelve stamps released between 1938 and 1947 showing King George VI and Seal of the Colony. The set (Scott #76 to #87) catalogs for around $50 MNH and around $40 used. A set of four stamps released on April 2, 1951 to mark the restoration of the legislative council in 1950. The set (Scott #98 to #101) catalogs for around $3 MNH or used. The design shows a map of the Islands and a portrait of KGV. A set showing local scenes and KGV followed on April 15, 1952 and that set (Scott #102 to #113) is sought after and catalogs for around $35 MNH and a little more for used. The designs show Sombrero Lighthouse, map of Jost van Dyke, sheep, map of Anegada, cattle, map of Virgin Gorda, map of Tortola, badge of the Presidency, Dead Man’s Chest, Sir Francis Drake Channel, Road Town, and map of Virgin Islands. A set of fifteen stamps released on November 2, 1964 showing a head portrait of Queen Elizabeth II (QEII) and local scenes. The set (Scott #144 to #158) catalogs for around $70 MNH and around $45 used. The designs show Bonito, seaplane at Soper’s Hole, brown pelican, Dean Man’s Chest, Road Harbor, Fallen Jerusalem Island, The Baths of Virgin Gorda, map of Virgin Islands, ferry service: Tortola – Saint Thomas, The Towers, plane at Beef Island Airfield, Virgin Gorda Island, yachts at Tortola, and badge. A set of seventeen stamps released on February 16, 1970 showing Ships. The set (Scott #206 to #222) catalogs for around $32 MNH and around $40 used. The designs show Carib Canoe, Santa Maria, H.M.S. Elizabeth Bonaventure, Dutch Buccaneer, Thetis, Henry Morgan’s ship, Frigate Boreas, Schooner L’éclair, H.M.S. Formidable, H.M.S. Nymph burning, Packet Windsor Castle fighting French privateer, Frigate Astrea, H.M.S. Rhone, Tortola Sloop, H.M.S. Frobisher, Booker Line Viking, and Hydrofoil Sun Arrow. A long set of nineteen stamps released on July 3, 1985 showing Birds. The set (Scott #490 to #508) catalogs for around $50 MNH and around $55 for used. The designs show boatswain bird, night gaulin, rain bird, mockingbird, chinchary, wild pigeon, bittlin, black witch, pond shakey, killy-killy, thrushie, marmi dove, little gaulin, ground dove, blue gaulin, pimleco, white booby, cow bird, and turtle dove. A set of four stamps and a souvenir sheet released in April of 1993 in the Tourism theme. The set (Scott #766 to #769 and #770) catalogs for around $17 MNH or used. The designs show swimming from anchored yacht, sailboat, scuba diver in pink wetsuit, and snorkelers and anchored boat. The souvenir sheet shows Trimaran and scuba diver. The first coin of Virgin Islands was a British Colony Standard Coinage Bronze Cent issued in 1973 showing QE bust in Obverse and Green-throated Carib and Antilean Crested Hummingbird in Reverse. The issue had a mintage of 53K and catalogs for about a dollar in BU. The first gold coins were 0.0241 troy ounce 25 Dollars issue released in 1980 showing QE bust in Obverse and Osprey and Denomination in Reverse. The issue has a mintage of 11K and catalogs for around $40 in UNC. Currently, Virgin Islands use the US dollar as its currency. Coins $3 and up Common Cents in BU starts around $3. Proof sets from the 1970s onward starts around $10. Commemorative Silver Proofs Starts around $25. Low Mintage Animal Proofs, Proof Sets with Silver Coins, etc start around $50. Gold Proofs, Rare Silver Fish Proof Sets, etc go well into the 100s. Watercolor, Pottery, paintings, baskets, soaps and candles are some of the souvenirs from the Virgin Islands. Jewelry $15 and up Themed Enamel Brooches start around $15. Bird Themed Gold and Silver Pendants start around $40. Miscellaneous Collectibles $5 and up Flags, Banners, Patches, etc start around $5. Souvenir Cups, Plates, etc start around $15.